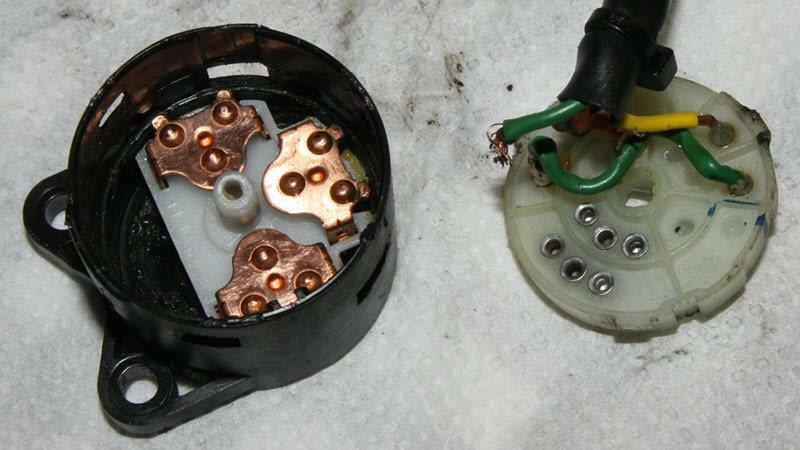 Gotta love this site. .
Walterg posted this picture of an ignition switch a couple of years back. I would refresh it to show first of all what the 2000 era switches are like inside. The switch block is held onto the key part by 2 Phillips screws, it takes just a few seconds to drop off. Release the clip on the black body and tilt the white switch plate out. In this one the grease looks quite fresh, often its hard almost like candle wax. Wipe the old grease out and replace it with fresh Vaseline. Note how the green wire has snapped off, it did that because the wires aren't held at the back so they flex at the weakest part, next to the solder joint until the copper work hardens and snaps. I don't think it is possible to put the switch together wrong, at least I haven't managed to yet. When you put it back together, fasten the wires to the back cover and arrange them so the loom flexes gently over several inches, don't strap the wires tightly together. Post No14 by MartyNZ with the bottom right picture is correct in orientation or I would think so as I put the ignition switch back together using this picture and it worked. I think the main culprit that I did not think about nor was I aware of was relay No2. I replaced all of the Relay's with the newer Omron's and replaced all of the fuses under the seat since I was there and after installing the battery and fresh fuel it fired up. .
As I informed Docc I felt like I needed a flogging as I compared it to forgetting to add fuel lol. But I had no idea about the No2 relay but I should have just out of course of action replaced all of the relay's just to see what would happen. But since I had it in my head that the No5 relay would have caused the problems I was having I thought it was something more involved. I am adding this information just in case someone else down the road has there Moto Guzzi start to run very bad and after of course changing out the No 5 Relay then as a course of action should check Relay No 3 but the bike should run normal in neutral from what I have been told and then run bad in gear of which would mean a bad neutral safety switch. To check this one can run a jumper wire to eliminate No 3 Relay. But as in my case it simply ran horrible all the time of which by a great deal of reading here on the forum No2 Relay has a bunch of stuff that more or less tells other Relay's what to do. But at least now I have a clean and greased Ignition switch and Dioxit Gold on all of the Relay's and Fuses not to mention some clip together connection under the fuse block. Now as soon as I have time I am going to add another ground and check the factory ground connections. Again Thanks to the good members of this forum.